Cheese cloth is a familiar item even to those who have never made cheese. Grocery and department stores sell this loose-weave, stringy cotton fabric in small plastic packages for both food and craft purposes. But--Don't buy it for making cheese! The primary purpose of cheesecloth is to catch and drain the curds that form the cheese. Many cheese recipes produce very fine curds that will become entangled in the open weave of these off-the-shelf cheesecloths. And, believe me, if you're faced with the task of trying to pick your curds from the web of the cloth, you'll feel like just throwing the whole thing away! These cloths are also so flimsy that they won't stand up to even one good cleaning without falling apart. If you plan on making even one batch of cheese, do yourself a favor and pass on the pre-packaged cheesecloth at your local grocery. So, if you're not supposed to use cheesecloth for cheesecloth, what to do? There are actually several good options. 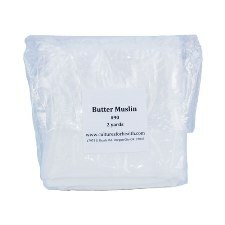 Butter muslin is a finer weave than cheesecloth, and can be used in making all kinds of cheese. It is more expensive, but it is an excellent investment if you plan to make cheese on a regular basis. Unfortunately, you probably won't find butter muslin at your local store; you will need to order it from a cheesemaking supply company, so plan ahead! Cultures for Health has butter muslin and larger weave cheesecloth, as well as any other cheesemaking supplies you may need. Another option is case cloth--something you probably have around the house and didn't know it. If you have a 100% cotton pillowcase or sheet, then you're all set to go with draining your cheese. Cut to the desired size, wash and sanitize with bleach water or by boiling. Cotton handkerchiefs also work great for draining smaller amounts of cheese. No need for ordering or making a trip to the store! Nylon tricot is also an option that you can obtain locally. Your local department or fabric store should have a bolt of this material on hand. Have them cut you a yard or two, and you'll have all you need for making your cheese. Note: you can also obtain your case cloth this way if you don't want to sacrifice your bedding! Professional cheesecloth has a looser weave than butter muslin and can also be purchased from cheesemaking supply companies. This cheesecloth is fine for draining larger curds and for lining the molds used in making hard cheeses. As with other equipment and utensils used in cheesemaking, you will want your cheesecloth to be clean and sanitary. The most important thing to remember is to clean it immediately after use. Rinse your cloth in cold water, then wash with detergent. A small amount of bleach added to the water will help sanitize and keep it white. Boiling the cloth will also help remove any traces of cheese that may make your cheesecloth smell less than fresh. When you're finished, hang in a clean area to dry. When dry, place in a drawer or cabinet to prevent dust from settling in it. For further protection, fold and place in a sealable plastic bag--just be sure the cloth is completely dry first. Of course... if you've caught the cheesemaking bug, you probably won't need to store it at all, because you'll be ready to use it again for making another delicious goat cheese! Articles are updated frequently, so check back here for any new information related to cheese cloth!